Celebrities are out in full force for Jonathan Ross’ famous annual Halloween bash at the television host’s north London manor. Stars including David Walliams, Jimmy Carr, Keith Lemon and Shirley Ballas were among those to attend the presenter’s party on Wednesday night. Stand-up comedian Lemon donned a black Venom costume alongside his partner Jill Carter, who dressed as Batman villain the Joker. Strictly star Shirley Ballas stepped out dressed as Catwoman, while comic David Walliams arrived dressed as Ming the Merciless from Flash Gordon. It comes after the comedian was accused of racism after attending the same event last year dressed as North Korean dictator Kim Jong-un. Talk show host Ross throws the glitzy bash at his house, just off Hampstead Heath, every year – with many big name stars on the guest list. Ahead of the arrivals about 100 members of the public, including many children, gathered outside the house just off Hampstead Heath. Flames were projected onto the building’s facade and two large clown faces loomed over the hedge in the front garden, where grotesque looking clowns and circus performers handed out sweets to the children. Ominous music could be heard playing down the street, which had been shut off to traffic. Other costumes on display included a werewolf, a skeleton and the Stay Puft Man from Ghostbusters. Dynamo arrived dressed as an undead American civil war era hunter and aimed his gun at the cameras before shouting “I’m going hunting tonight”. David Mitchell was dressed as a fly and wore large, green plastic sunglasses. Chris O’Dowd and Dawn O’Porter went as matching whoopee cushions. Stephen Merchant went as Doctor Strange, the Marvel character Benedict Cumberbatch played on the big screen. “I’m giving Cumberbatch a run for his money,” he said. Follow live updates of the Carabao Cup quarter final draw as Man City prepare to learn their potential quarter-final opponents if they see off Fulham. Fittingly for a Halloween derby, malign spirits attended an otherwise drab confrontation between the Edinburgh rivals at Tynecastle, where Hibs’ striker, Florian Kamberi, was sent off for a second yellow card, Clevid Dikamona had a possible match winner chalked off for unclear reasons in the dying seconds, which lasted long enough for Neil Lennon to be struck by a coin thrown from the crowd. These teams shared an unwanted characteristic, in that both came into the game off the back of defeats by Celtic. Hearts’ setback, in the Betfred Scottish League Cup semi-final at Murrayfield, was doubly costly because injury deprived them of Steven Naismith, top scorer in the Scottish Premiership, who was added to a casualty list which already included long-term absentees, Christophe Berra, John Soutter and Uche Ikpeaza. Necessity dictated that Peter Haring started again, although suffering from a hernia, while Dikamona had little time to recover from a dead leg. On Hibs’ side, David Gray and Paul Hanlon were missing and Jamie MacLaren was on the bench because of a shortage of match fitness, but Darren McGregor returned. A fitting and sensitive touch was observed at the minute’s silence for the Leicester tragedy when Lennon and Craig Levein stood side by the edge of the pitch, the former having been a Foxes player and the latter their manager. 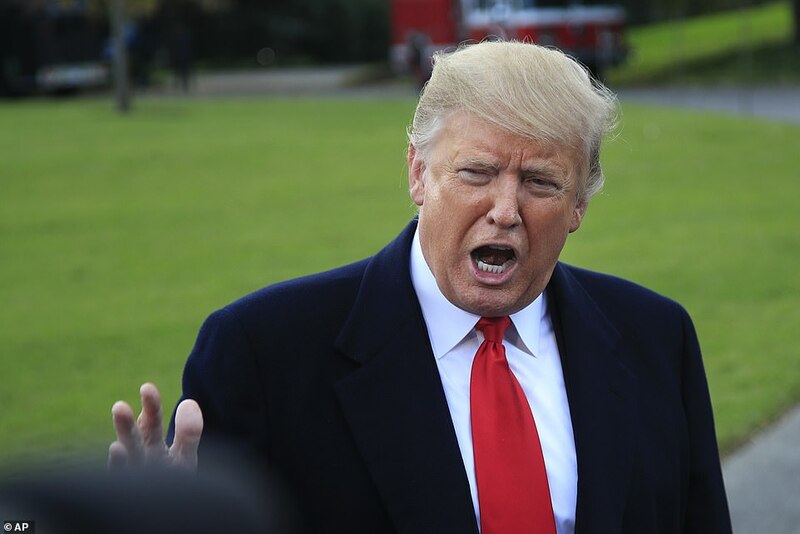 President Donald Trump said Wednesday he may triple the U.S. military contingent being sent to the southern border to 15,000, as he once again pointed to migrant caravans and what he called ‘roughness’ among its members. Trump spoke on the way to a Florida campaign stop as a fourth caravan began forming, and after the Pentagon on his orders was dispatching 5,200 U.S. military forces to the U.S.-Mexico border. 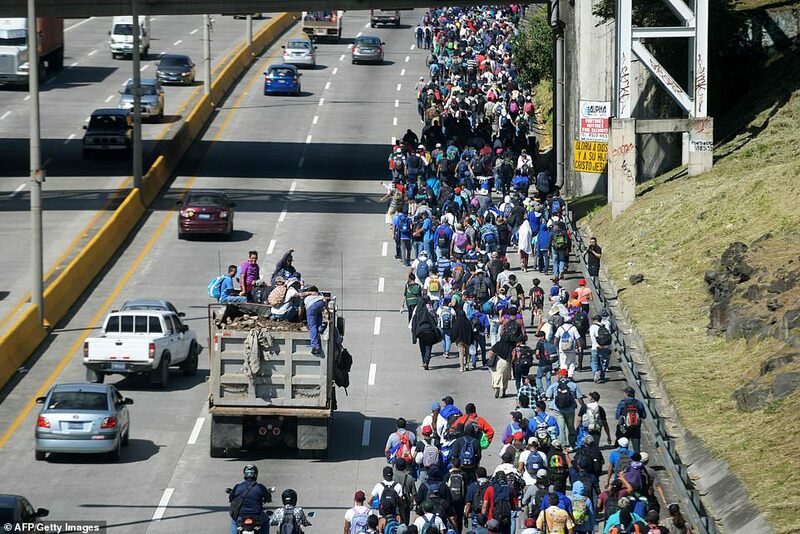 ‘As far as the caravan is concerned, our military is out. We have about 5,000, eight [thousand], we’ll go up to anywhere between ten and 15,000 military personnel on top of Border Patrol, ICE, and everybody else at the border,’ Trump said. A force of that size would exceed the number of troops stationed in Afghanistan. 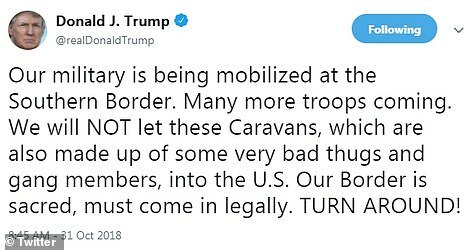 The president also explicitly rejected having a ‘fear-mongering’ motive when asked about it, having repeatedly tweeted about violent tendencies within the caravan comprised of men, women, and children from Central America, with the elections just six days away. He also has introduced the issue of ending birthright citizenship through an executive order, a method Speaker Paul Ryan and others have criticized given forceful language in the 14th Amendment. ‘No, not fear-mongering at all. Immigration’s a very important subject,’ Trump said. 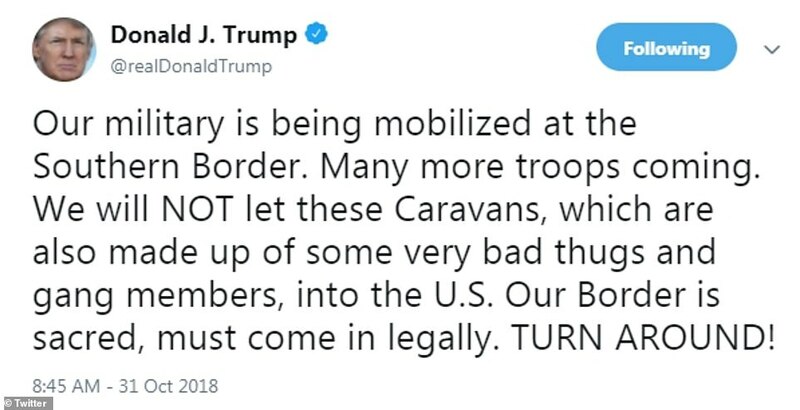 The president also pointed to the ‘roughness of these people’ in the first and second caravans. ‘We’re not going to allow people to come into our country that don’t have the well-being of our country in mind,’ he said. Trump also rejected analyses that it would take weeks for the caravan arrive, as members are traveling in foot as they make their way through Mexico. ‘They’ll be here fast. they’re trying to get up by train. they’re trying to get up by truck and by buses. We’ll be prepared,’ Trump said. Former Gen. Stanley McChrystal, who led forces in Afghanistan and previously ran Joint Special Operations Command, expressed some skepticism about the use of U.S. military to stop the Caravan in an interview on CNN. ‘Well, I don’t know whether they’re needed or not. I don’t know whether we’ve got other assets available,’ he said. ‘Because that’s the way it starts. You say, I have this problem, this requirement, and then you ask the secretary of defense to put his people into the process of sourcing that intelligently, rather than starting with a number and going that way,’ he added. 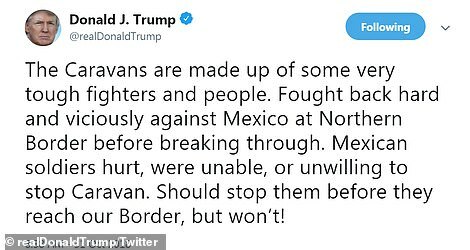 The president faulted Mexican authorities for failing to stop the caravan, after ordering the Pentagon to dispatch troops to the border, once again claiming there were ‘bad thugs and gang members’ among the group. ‘The Caravans are made up of some very tough fighters and people. Fought back hard and viciously against Mexico at Northern Border before breaking through,’ Trump tweeted Wednesday. 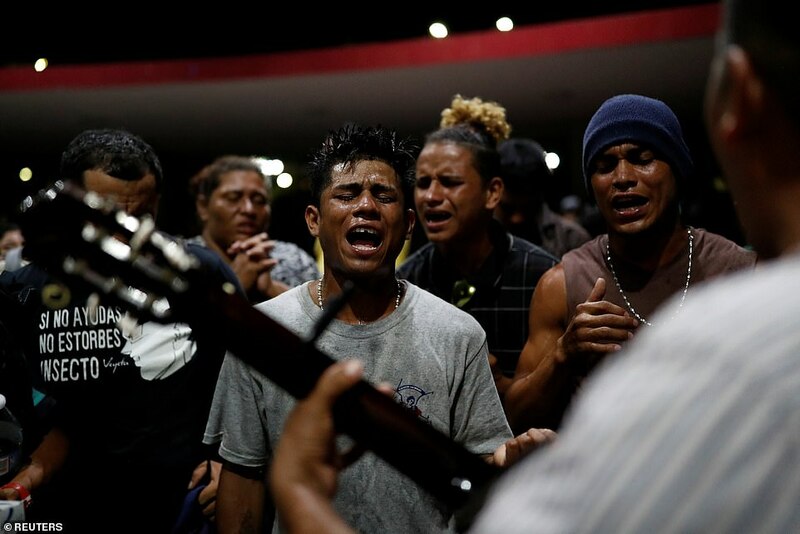 Some 2,000 migrants traveling in two groups departed El Salvador’s capital Wednesday morning on their way to the US by way of Mexico, making it the fourth caravan to embark on the 1,000-journey in the last two weeks. 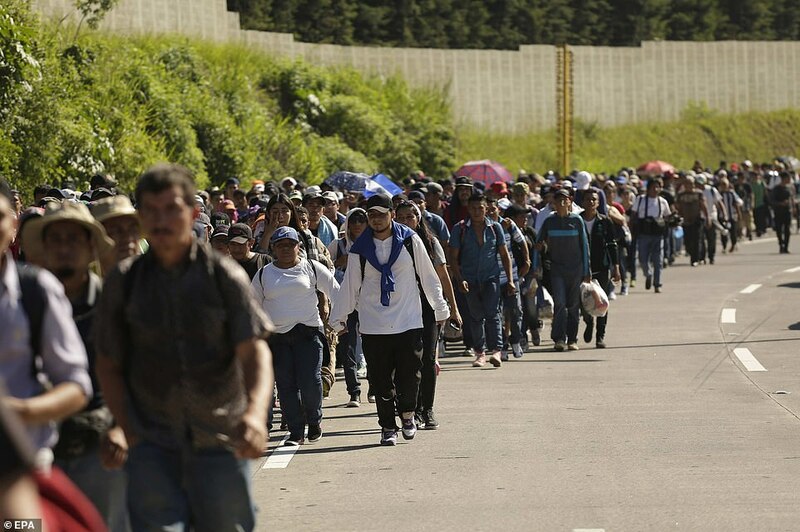 This latest group hit the road even as President Donald Trump promised to send thousands of troops – possibly as many as up to 7,000 by some estimates – to secure the southern border and increased pressure on Mexico to halt the flow of people. 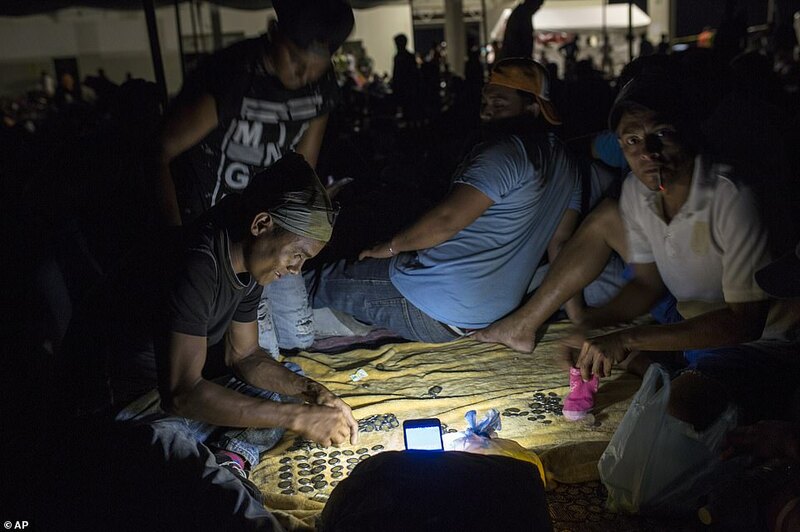 Police in San Salvador estimated the two groups leaving the capital numbered around 1,000 each. One cohort left around dawn, followed by a second later in the morning. 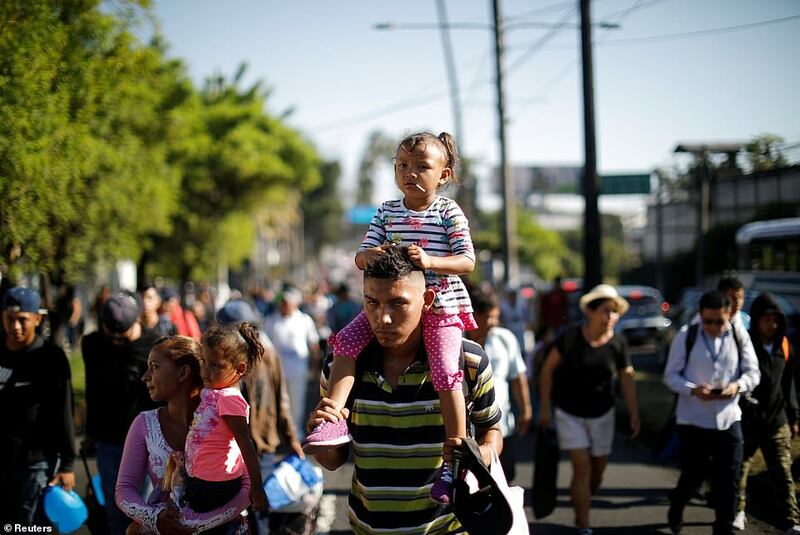 The caravan included men and women pushing strollers and others with children on their shoulders. 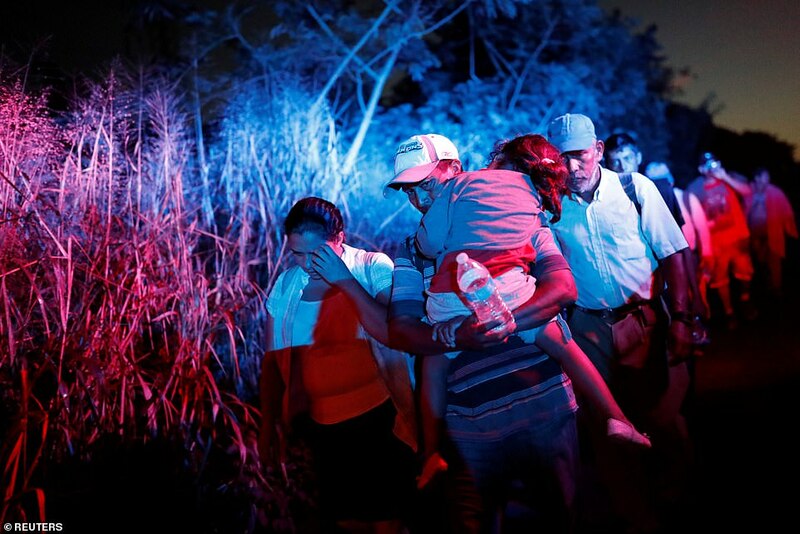 On Sunday, a separate group comprising about 300 people set off for the US border from the Salvadoran capital. 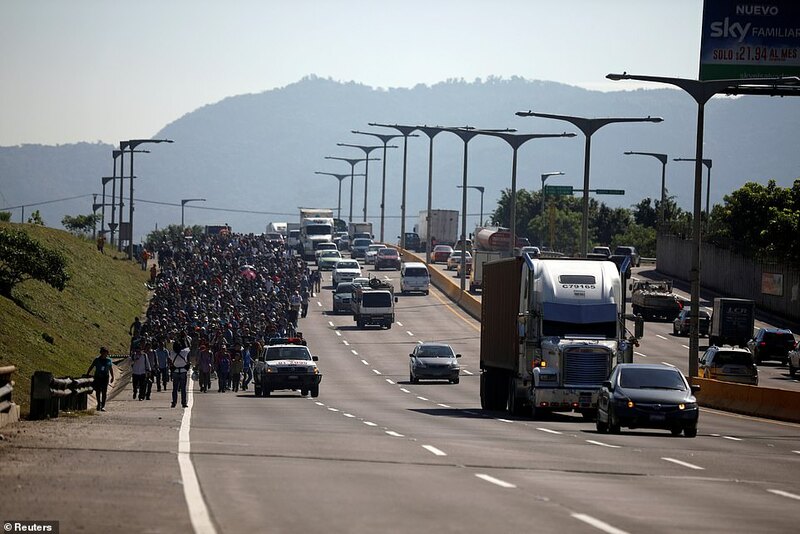 The first caravan numbering 4,000 mostly Honduran national, which has been on the road for the past two weeks, planned to rest at least a day or longer in the southern city of Juchitan beginning Wednesday, hoping to organize mass transport northward after days of hard walking in scorching temperatures that have left them about 900 miles from the nearest US border crossing in McAllen, Texas. ‘We are waiting to see if they are going to help us out with buses, to continue the trip,’ said Omar Lopez, 27. 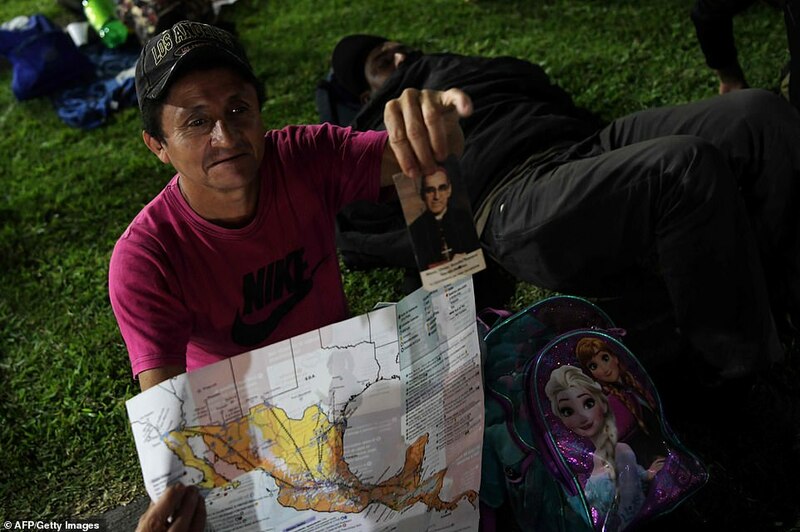 Organizers say the buses, if they do materialize, would take the migrants to Mexico City for meetings with legislators, not to the still-distant US border, though some would probably continue to the border after reaching the capital. 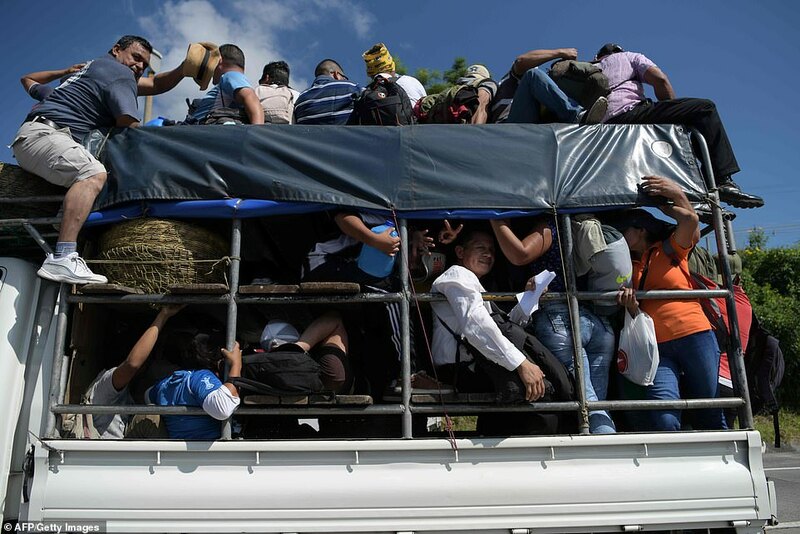 It’s unclear if Mexican authorities would agree to provide the vehicles, in light of White House press secretary Sarah Huckabee Sanders’ statement today praising the country’s leadership for stopping the migrants from getting rides. 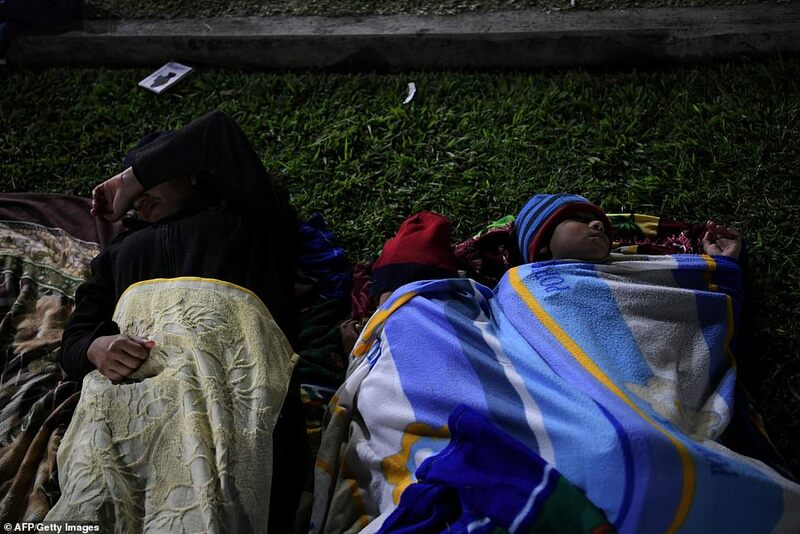 A second, smaller group, of 1,000 or so migrants who forced their way into Mexico on Monday was trailing some 250 miles back, stopping for the night in the city of Tapachula. 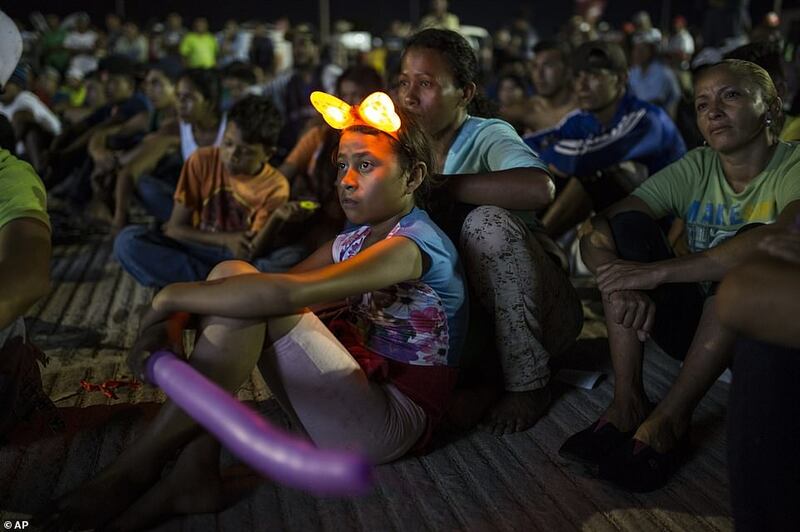 A third group of migrants from El Salvador legally crossed the international border bridge between Guatemala and Mexico on Tuesday and headed to Tapachula. 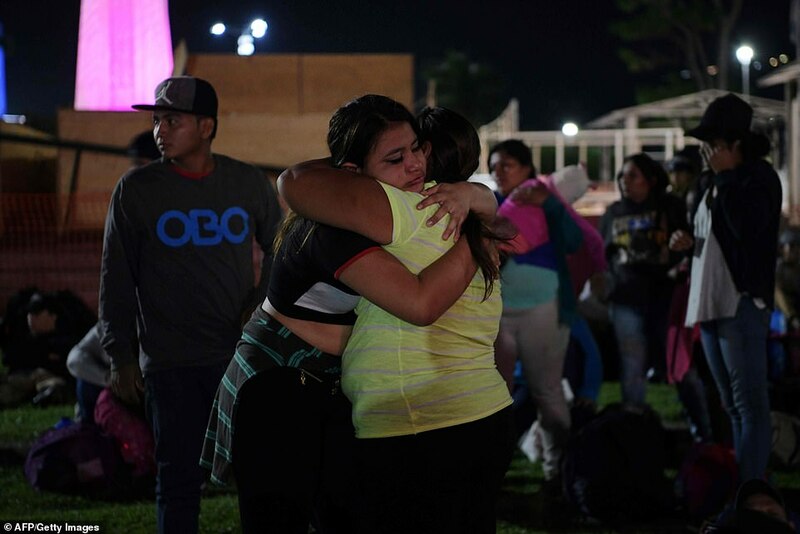 At a Tuesday evening assembly, participants in the first, largest caravan named a committee to negotiate with Mexican authorities over a possible ‘bridge plan’ that could carry them the 700 miles separating Juchitan from Mexico’s capital by bus. There was no indication from officials whether the request to transport the perhaps 4,000 people remaining in the group would be granted. 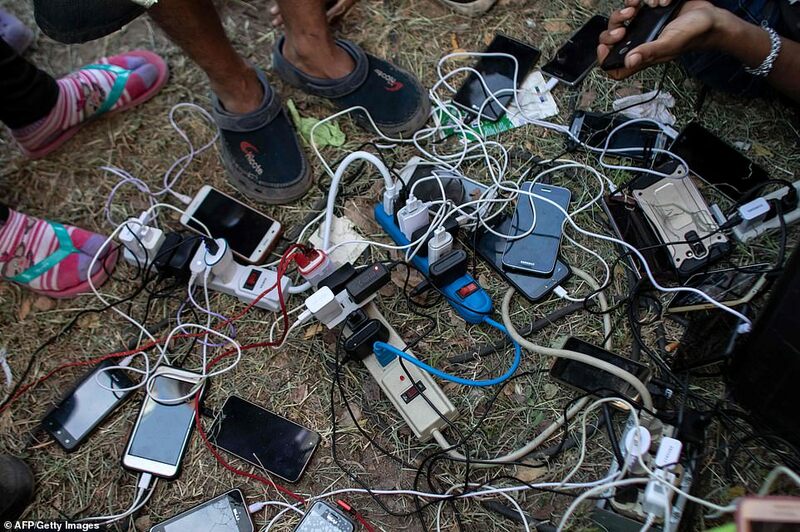 Meanwhile, the US Border Patrol this week warned Texas landowners along the southern border to get ready for the arrival of ‘armed civilians’ wishing to assist the National Guardsmen and Border Patrol agents in stopping the caravans from entering the US. McGauley said he already has members at three points of the state’s border with Mexico and expects to add 25 to 100 more people in the coming days, even though the first caravan is not expected to reach the nearest border crossing until December. Monica Marin, an Oregon resident, said she has raised about $4,000 online to help militias buy supplies. 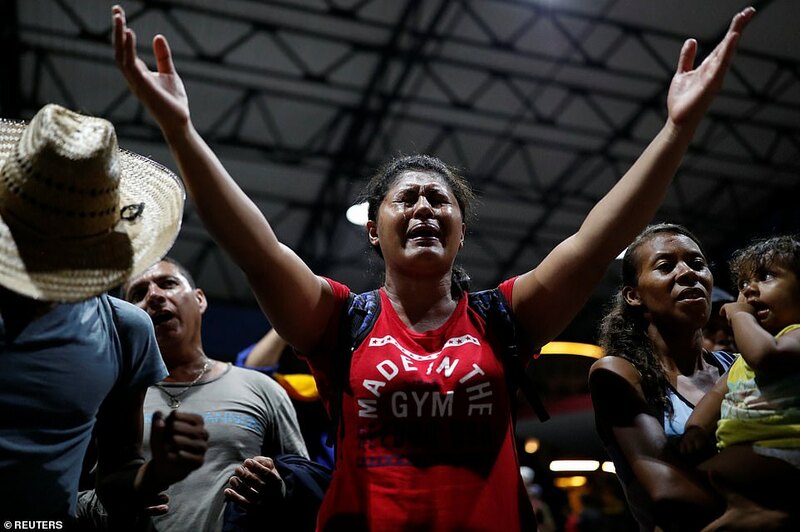 She argued that members of the caravan are dangerous, echoing President Donald Trump’s baseless claim that ‘unknown Middle Easterners’ are mixed in with the crowd. 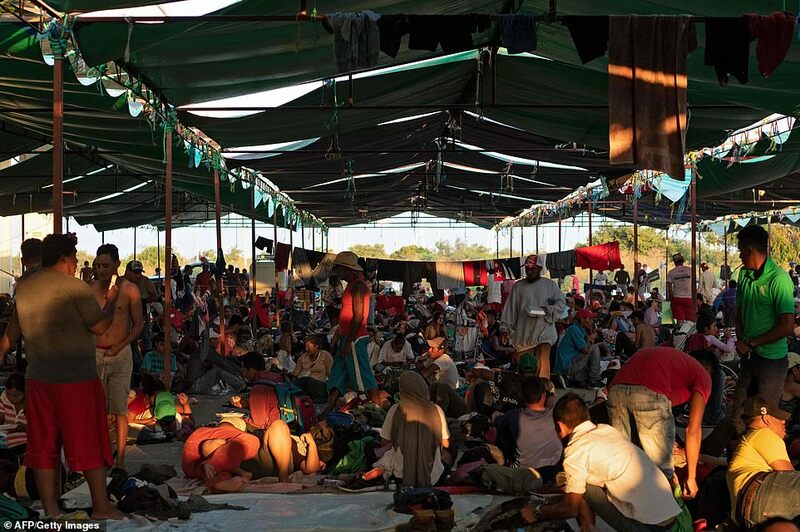 In Juchitan, they spent the night on a municipal-owned lot on the outskirts of town where a high ceiling sheltered a cement floor. Outside the structure many more bedded down on blankets or cardboard sheets in the grass, with some lashing tarps to the foliage for rudimentary shelter. 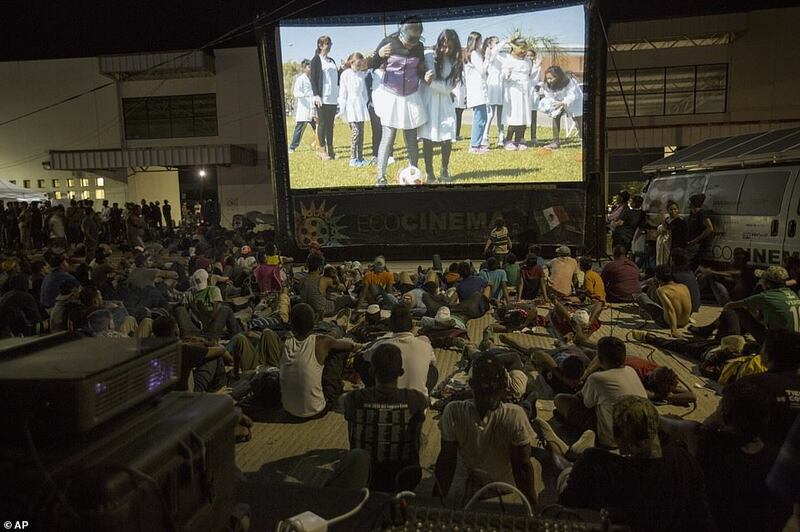 Full tanks of water were set up for people to be able to bathe, and a large video screen showed soccer programming and then cartoons for the kids. 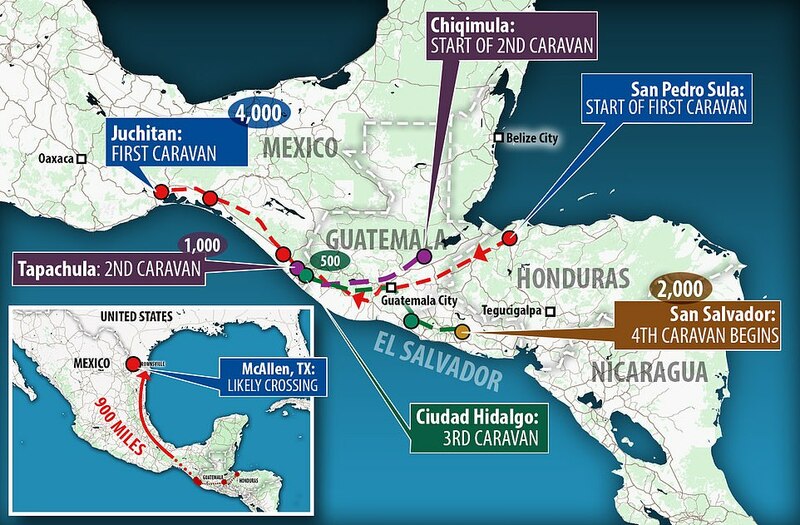 The two caravans combined represent just a few days’ worth of the average flow of migrants to the United States. 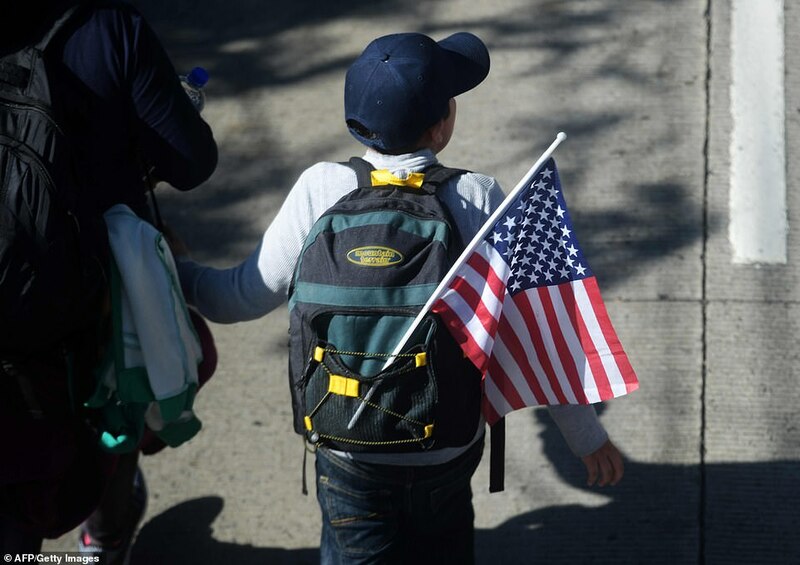 Similar caravans have occurred regularly over the years, passing largely unnoticed, but the new ones have become a hot-button political issue amid an unprecedented pushback from Trump. With just a week to US midterm elections, the Pentagon has announced it will deploy 5,200 troops to the Southwest border, and Trump has continued to tweet and speak about the migrants. 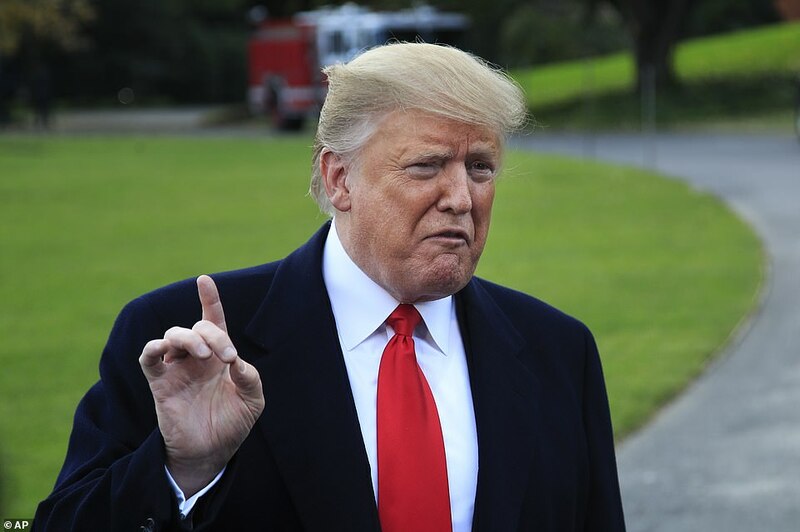 On Wednesday, Trump again ratcheted up the rhetoric, tweeting without any evidence that the caravans are made up of ‘some very bad thugs and gang members’ trying to enter America’s ‘sacred’ border. 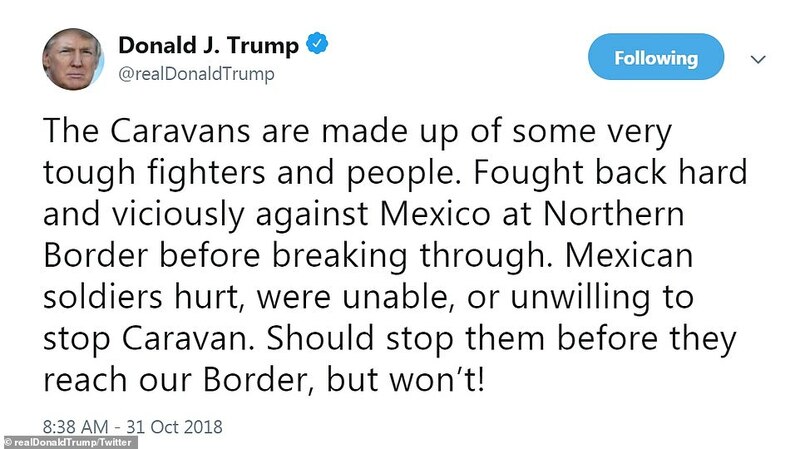 In a companion tweet, Trump cast blame on Mexican forces for being unable ‘or unwilling’ to stop the caravans’ progress towards the US border. 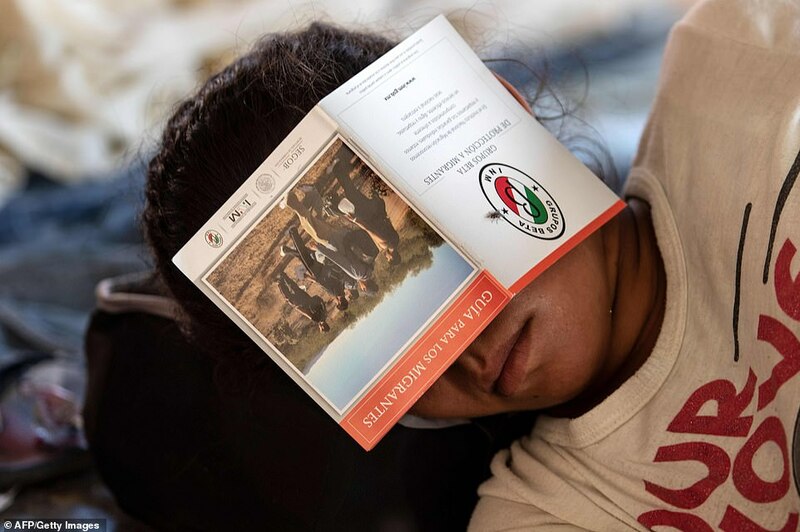 Worn down from long miles of walking and frustrated by the slow progress, many migrants have been dropping out and returning home or applying for protected status in Mexico. The initial group is already significantly diminished from its estimated peak at over 7,000-strong. 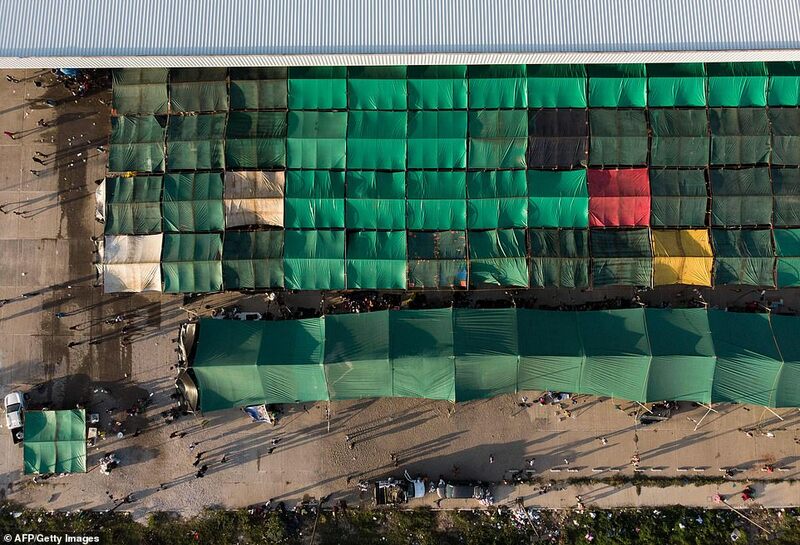 A caravan in the spring ultimately fizzled to just about 200 people who reached the US border at San Diego. 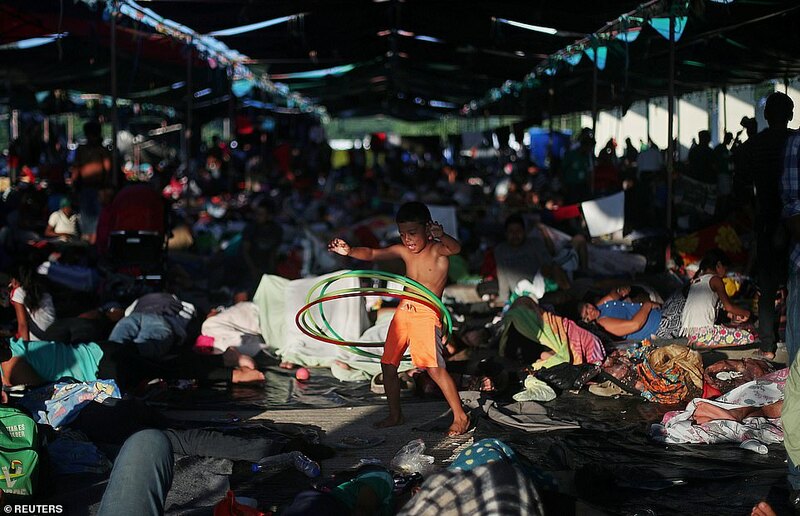 Deputy foreign ministers from El Salvador, Guatemala, Honduras and Mexico met Tuesday and agreed to coordinate ‘special attention’ for the caravans, guaranteeing human rights, humanitarian assistance and ‘a safe, orderly and regular migration’ in accordance with each country’s laws. Mexico’s Interior Department said two Hondurans who requested entry were identified as having arrest warrants back home, one drug-related and the other for suspected homicide. They were deported. 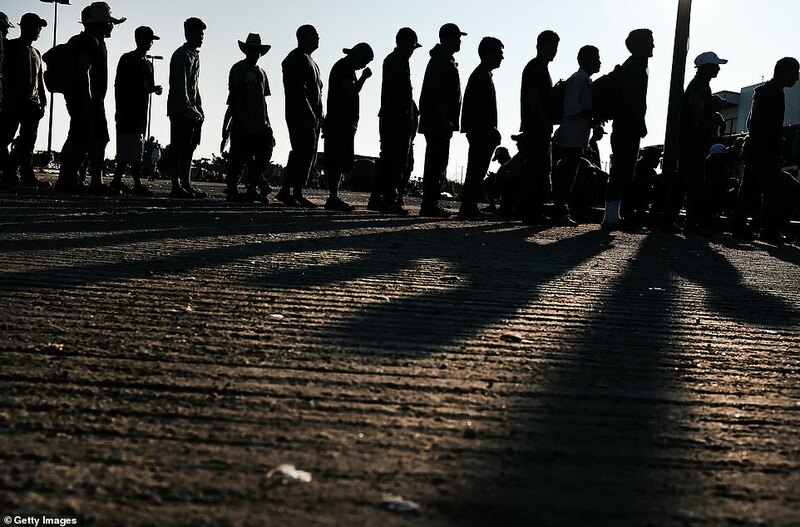 The department said in a statement that the men were part of ‘the migrant caravan,’ but did not say which group or specify when they were detained at checkpoints in the southern state of Chiapas. 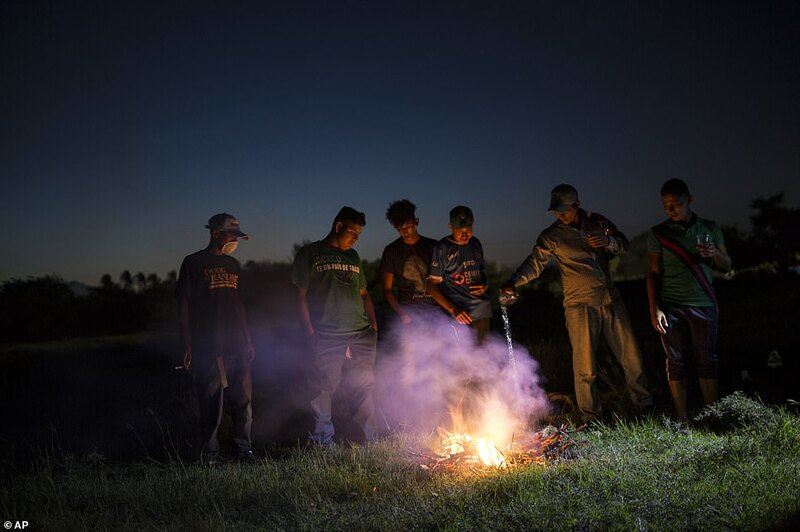 Echoing their countrymen in the initial caravan, Hondurans in the second group talked of fleeing poverty and gang violence in one of the world’s deadliest countries by homicide rates. 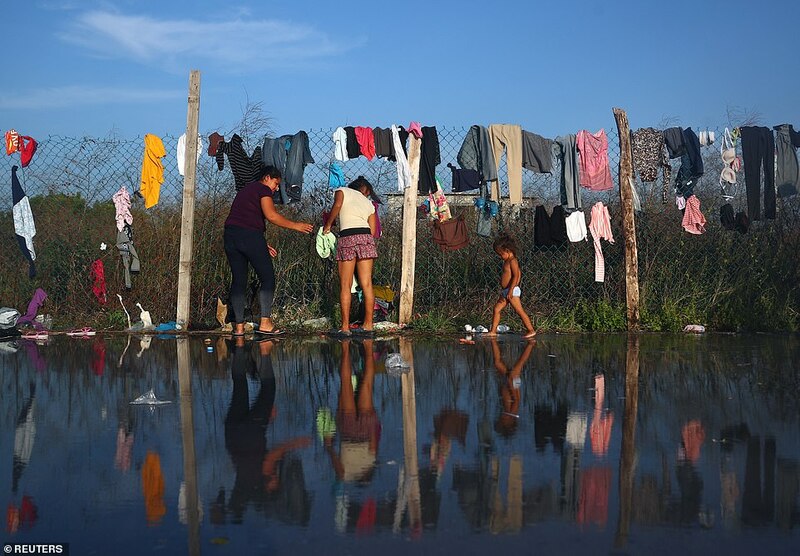 They said asylum in the United States is their primary goal, but some expressed openness to applying for protected status in Mexico if that doesn’t work out. Two men who were paralysed in separate accidents more than six years ago can stand and walk short distances on crutches after their spinal cords were treated with electrical stimulation. David Mzee, 28, and Gert-Jan Oskam, 35, had electrical pulses beamed into their spines to stimulate their leg muscles as they practised walking in a supportive harness on a treadmill. Doctors believe the timing of the pulses – to coincide with natural movement signals that were still being sent from the patients’ brains – was crucial. 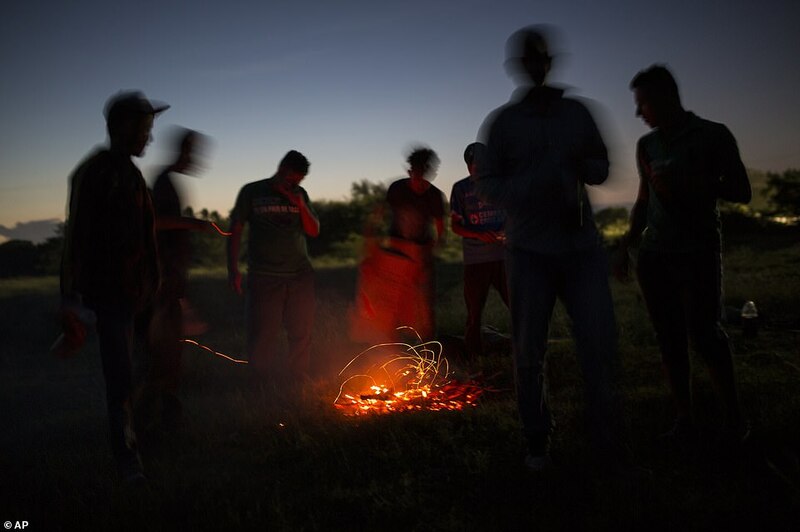 It appeared to encourage nerves that bypassed the injuries to form new connections and improve the men’s muscle control. In many spinal cord injuries a small portion of nerves remain intact but the signals they carry are too feeble to move limbs or support a person’s body weight. “They have both recovered control of their paralysed muscles and I don’t think anyone with a chronic injury, one they’ve had for six or seven years, has been able to do that before,” said Grégoire Courtine, a neuroscientist at the Swiss Federal Institute of Technology in Lausanne. Mzee was paralysed in a gymnastics accident in 2010. He recovered the use of his upper body and some control of his right leg after intensive rehabilitation at a paraplegic centre in Zurich. Doctors there told him further improvement was unlikely, but after five months of training with electrical stimulation, he regained control of the muscles in his right leg and can now take a few steps without assistance. Oskam was paralysed in a traffic accident while cycling home from work in 2011. He could not walk before the study but can now take a few steps outside with crutches and believes he will soon go one better. “I should be able to have a BBQ standing on my own in the near future,” he said. The treatment is far from a cure for paralysis: while both patients continue to improve, they still use wheelchairs in their daily lives. But doctors believe the work is an important proof of principle. It shows that precisely timed electrical stimulation can help recover some of the movement patients lose when they suffer such devastating injuries. “The big challenge is whether it can really change their life,” said Courtine. “This is an important first step, but the key now is to apply this very early after an injury when the potential for recovery is much larger.” His next trial will include patients whose injuries are no more than a month old. The scientists developed the electrical stimulation procedure to help paraplegics walk by activating the necessary leg muscles in precisely the right order. The pulses were delivered to the relevant nerves by wireless electrodes implanted in the lower back. Details of the work are reported in Nature and Nature Neuroscience. Scientists found that after a week of training, Mzee, Oksam and a third man, Sebastian Tobler, who had a more severe spinal injury, could all walk with electrical stimulation, provided they were supported by a harness. While Tobler cannot walk without stimulation, he uses the system to train on the treadmill, and has an adapted version for a specially adapted trike that he uses for off-road biking. Last month two separate teams announced that a number of other patients had managed a handful of steps with implants that delivered continuous electrical stimulation to their spinal cords. None of the patients were able to walk when the electrical pulses were turned off, however, perhaps because continuous stimulation is less effective at encouraging the growth of new nerve connections. Jeep’s Wrangler-based pickup is coming soon… but with how many doors? Cult of Jeep devotees will have a lot to celebrate this holiday season, because the long-awaited Wrangler pickup truck will make its debut at the LA Auto Show in late November. Some have speculated that the new Jeep JL-chassis pickup will revive the Scrambler name used on the Eighties CJ Wrangler, but Jeep hasn’t given any hints as to whether that will be the case. The official word came in a release Tuesday from LA Auto Show authorities. We can safely assume that this truck will share the underpinnings of the standard JL Wrangler, which means it will probably be offered in the US with either a 2.0-liter turbocharged four-cylinder engine or a 3.6-liter V6. We’d also expect to see Fiat Chrysler Automobiles’ eTorque mild-hybrid system carried over as an option, as well, along with all of the JL’s front-suspension goodies. The truck’s rear suspension could change, based on how Jeep is imagining customers will use it. It could end up being stiffer riding, with a big bed-load of cargo in mind, but we’re guessing it’ll take a more measured approach. It’s a Wrangler, though, so naturally, it will have four-wheel drive and be super capable off-road. We’d be excited to see the pickup keep the regular model’s removable roof panels and the folding windshield that are much-loved, long-time Wrangler trademarks — mostly because it would look seriously excellent idling through some dusty desert, all opened up and folded down. The current question is about possible cab configurations. Spy photos have only shown a four-door model, but a two-door model also seems possible. Fingers crossed that the Wrangler pickup arrives in time for next year’s Rebelle Rally, so Roadshow’s own Emme Hall has something new in which to win! Spotify announced today (Oct. 31) that starting Nov. 1, it is giving away a free Google Home Mini to subscribers in the US that have a Spotify “Premium for Family” plan. New and existing family plan holders can sign up for the deal, but the offer will only last until the end of the year. The Home Mini is Google’s equivalent to Amazon’s Echo Dot—a speaker that has a virtual assistant, in this case Google Assistant rather than Amazon’s Alexa, built in. Up to six people can share a family account for $14.99 a month, and the Home Mini will be able to recognize just as many voices once Voice Match is configured. But while a free $50 gadget seems like a holiday giveaway, it’s just one component in a strategic partnership. A study by Adobe Analytics also found that nearly 50% of US homes will have smart speakers by the end of the year, which means Spotify can also ride on that trend, which Amazon has so far dominated, via the Home Mini. As Tech Crunch reports, it’s also a boon for Google, which can capitalize on pre-existing Spotify subscribers (there are over 80 million, although not all these are family plan users) to get into people’s homes. Market research firm MusicWatch found that paid streaming subscribers are 240% more likely buy a smart home gadget, meaning the partnership will also expose the Home Mini to users who are more willing to buy it, and Spotify can capitalize on those who might have needed the extra nudge to subscribe. After running the game once and choosing your settings, exit the game and open Windows Explorer. Navigate to your ‘DocumentsMy GamesFallout 76’ folder and open the file Fallout76Prefs.ini. This is where most of the game’s settings are located (with a few others in Fallout76.ini). If you search for ‘iPresentInterval’ you should find the line of text you need to change. If the line is missing, add it under the [Display] header. The revised line should read ‘iPresentInterval=0’ to disable vsync and remove the framerate limiter. As an alternative for users with Nvidia cards, you can try forcing vsync off in the Nvidia Control Panel. Go to Manage 3D settings and set Vertical sync to off. This definitely worked for me in testing, though it didn’t seem to work for others. I tried the same thing with an AMD graphics card, only using the AMD Settings to force vsync off. This didn’t appear to have any effect, so sticking with INI file editing is likely the best approach. To test if this worked, you can still launch the Fallout 76 beta even when a test isn’t currently in progress. Run a framerate overlay like FRAPS and you should see the initial loading screens with some insanely high framerates. On a fast PC with a 2080 Ti, I saw up to 2500 and more. If the framerate is sitting at 60, or on higher refresh rate displays it appears to target half your refresh rate (so 72fps on a 144Hz display), then it didn’t work. You may need to be running in fullscreen mode rather than borderless window mode. A few notes for now on removing the framerate limiter. Bethesda’s previous games have tied some of the game logic to the framerate, so things like physics and movement speed can break if you’re running at excessively high framerates. Skyrim with iPresentInterval=0 is basically unplayable—dragons teleport around and fly backward and other shenanigans—and Fallout 4 had a well-known problem where you could end up stuck on a terminal. With Fallout 76, it appears that Bethesda has made some changes to the engine to improve things relative to Fallout 4. I’ll confirm during the next beta test tomorrow, but I’m pretty sure the game supports running at your display refresh rate by default (up to 144Hz), even with iPresentInterval=1. So if you have a 144Hz or 120Hz display, the above INI hacking may not even be necessary. That’s the good news. The bad news is that going beyond 144fps still has some issues. Bethesda will need to ensure everything works properly and that everyone runs the game calculations at the correct rate, as you can’t have a multiplayer game where some people are able to move faster and break the physics. I noticed framerates of nearly 200fps inside some buildings during the beta, and as with Fallout 4, that caused things to speed up. Dubbed “speed hacking,” this is a bannable offense in most multiplayer games. Bethesda, speaking with Polygon, has confirmed it’s aware of the issue but doesn’t expect a fix until the game launches on November 14. It could be that Bethesda will lock out INI file edits, or put in a hard-coded FPS cap. Hopefully, the ultimate solution is to provide PC gamers with the ability to run with an unlocked framerate, at least up to a suitably high ceiling line 240fps, for those 240Hz display owners. The way I see it, if a game engine can handle 20-120 fps without problems, that same code can be adapted to handle 20-240 fps as well. As we’ve said before, hardcoded framerate caps are a relic of a bygone era and need to go away. Maryland has fired football coach DJ Durkin, the school announced Wednesday evening. In a statement, president Wallace D. Loh said, “Yesterday, the University System of Maryland Board of Regents announced numerous recommendations, including employment decisions about specific personnel on our campus. I accepted the Board’s recommendations. At the same time, I announced my retirement as president in June 2019. A rundown of the events that led to Maryland football coach DJ Durkin being placed on administrative leave and the resignation of strength coach Rick Court. The University of Maryland has parted ways with assistant AD for sports performance Rick Court in the wake of “mistakes” that led to the death of Jordan McNair. A Maryland player told ESPN’s Tom VanHaaren that athletic director Damon Evans informed the team Durkin was fired in a team meeting. The player said no one asked any questions. The team was told that Matt Canada remains the interim coach. Durkin, on paid administrative leave since Aug. 11, had been reinstated on Tuesday, following two separate investigations into the football program and five meetings and calls between the 17-member board of regents following the June 13 death of 19-year-old offensive lineman Jordan McNair from heatstroke he suffered at a May 29 workout. The decision to reinstate Durkin had been met with outrage and protests by students, politicians, McNair’s family members, and even some of the players themselves. Ellis McKennie, an offensive lineman for the Terrapins, tweeted his displeasure with Durkin’s reinstatement on Tuesday night. Maryland Gov. Larry Hogan issued a statement questioning whether the university had done enough on Tuesday and on Wednesday doubled down, demanding that the decision be reconsidered. Durkin went 10-15 in his two seasons as coach of the Terrapins, including a loss in the Quick Lane Bowl in 2016. He was hired by Maryland to succeed Randy Edsall in December 2015 after serving as defensive coordinator under Jim Harbaugh at Michigan. Prior to that, he was on the staff at Florida under Will Muschamp and Urban Meyer, who gave Durkin his first coaching job at Bowling Green, his alma mater. This week, Washington made an upgrade in the secondary, Dallas traded for receivers like it’s 2008, and the New York fire-sale fizzled faster than Eli Apple’s Giants career. ICYMI: Odell Beckham made some one-handed catches, Saquon Barkley ran around dudes, and Eli Manning threw a redzone interception. Another standard loss for the Giants, who fell to Washington, 20-13. Before that, the front office traded away dominant DT Damon Harrison for a 5th-rounder and disappointing CB Eli Apple for a 4th and 7th. Spin: Instead of going full Hinkie, the GMen ended up keeping Landon Collins (who will leave in free agency this summer) and Janoris Jenkins. In short, the Giants couldn’t even blow up their own team properly. They truly are the NFC’s Cleveland Browns. What’s Next: Sweet, merciful bye week, which gives them time to figure out why their second-string quarterback was arrested. ICYMI: Jerry Jones traded a first-round pick to Oakland in exchange for underperforming wideout Amari Cooper. This was as predictable as a sunset, and ten times as glorious. Meanwhile, Jason Garrett was spotted at a World Series game in Los Angeles. When asked if he thought this was an appropriate use of his coach’s time, Jones said, “I’m not associated with anybody who works any harder than (Garrett).” I don’t doubt him. Spin: If a 3rd-rounder for Golden Tate was an overpay (it wasn’t), than a first-rounder for Cooper is a Madoff-esque heist. The 76-year-old Jones has seemingly forgotten the Roy Williams trade of a decade ago, which you may remember resulted in zero Super Bowl victories. Cooper is due nearly $14 million next year and will presumably get an extension. REMINDER: Jones gave Williams a $54 million extension. Cooper’s agent is probably boat shopping at this very moment. THAT BEING SAID, Cooper is a 24-year-old two-time Pro Bowler, and he immediately becomes their best receiver. Purely from a talent perspective, Dallas got better over the bye … but at a cost. What’s Next: The Tennessee Titans, who aren’t nearly as good as the Iggles made them look a month ago. ICYMI: Washington is off to their best start since Brad Lidge was perfect. The victory over New York wasn’t as impressive as the Eagles’ win over those same Giants a few weeks ago, but hey, they still count the same. Adrian Peterson filled up the stat sheet with two touchdowns and a 60+ yard rush, which makes up for his fumble in the red zone. Safety D.J. Swearinger had two interceptions, and he should send Manning a fruit basket as thanks. The big news is the acquisition of safety Ha Ha Clinton-Dix (whose name sounds like a 90’s ska band) for a measly fourth-rounder. Spin: Clinton-Dix has been consistently inconsistent the past few years, which sums up every Packers player not named Aaron Rodgers. Regardless, he should create a formidable pairing with Swearinger. Washington’s front office sent a message to their locker room; they’re going for it NOW. With a 70-year-old AP as the team’s best offensive weapon, that should have already been obvious. Bottom line: the Green Bay organization made a trade with the Dan Snyder organization. Focusing on that fact by itself, who do YOU think won the trade? What’s Next: Home against the Atlanta Falcons. If Matty Ryan is TRULY a Philadelphian, he’ll get the win this weekend.